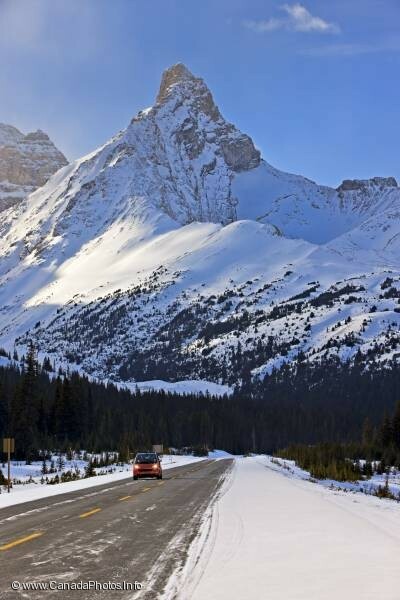 Winter scenery along the Icefield Parksway in Banff National Park, Alberta, with a Smart car on the icy highway. Smart Car dwarfed by Hilda Peak (3060 metres/10039 feet) as viewed from the start of the Parker Ridge trail along the Icefields Parkway, Banff National Park, Canadian Rocky Mountains, Alberta, Canada. Banff National Park forms part of the Canadian Rocky Mountain Parks UNESCO World Heritage Site.